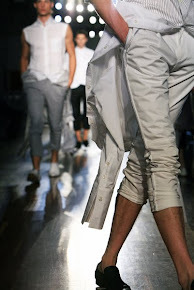 Vrettos Vrettakos presented his latest creations during the 7th Madwalk, The Fashion Music Project. The greek fashion designer showed impressive creations with swarovski crystals and shiny materials. All items of his haute couture and bridal wear collection. The hair was styled by Konstantinos Vrettakos, inspired by Helmut Newton and the glory days of Studio 54. Frangos Nikolas completed the looks of Vrettos Vrettakos with amazing jewellery, like a luxury headpiece mask. Eleni Foureira in a colourful custom made jumpsuit by Vrettos Vrettakos. See more of the 7th Madwalk, The Fashion Music Project in my previous post! Photos courtesy of MADWALK by Panoulis Photography.